The Mysterious Benedict Society – You may not have heard of this series, but right now David would tell you it’s his favorite. It’s a group of gifted kids who have to work together to solve a big mystery and Mr. Benedict is their leader. David is hoping they come out with movies based on the books! Percy Jackson – We read these together since I hadn’t read the books before. We enjoyed them and learned more about Greek mythology by reading them. Harry Potter – We started this series when David was 7, with me reading to him. We took a break between books 4 and 5 since the books mature as the characters age. David hasn’t read book 7, but he did watch the movies. He’s not into boy-girl stuff yet and since book 7 has multiple love stories happening, I thought he should wait until he could appreciate it a little more. 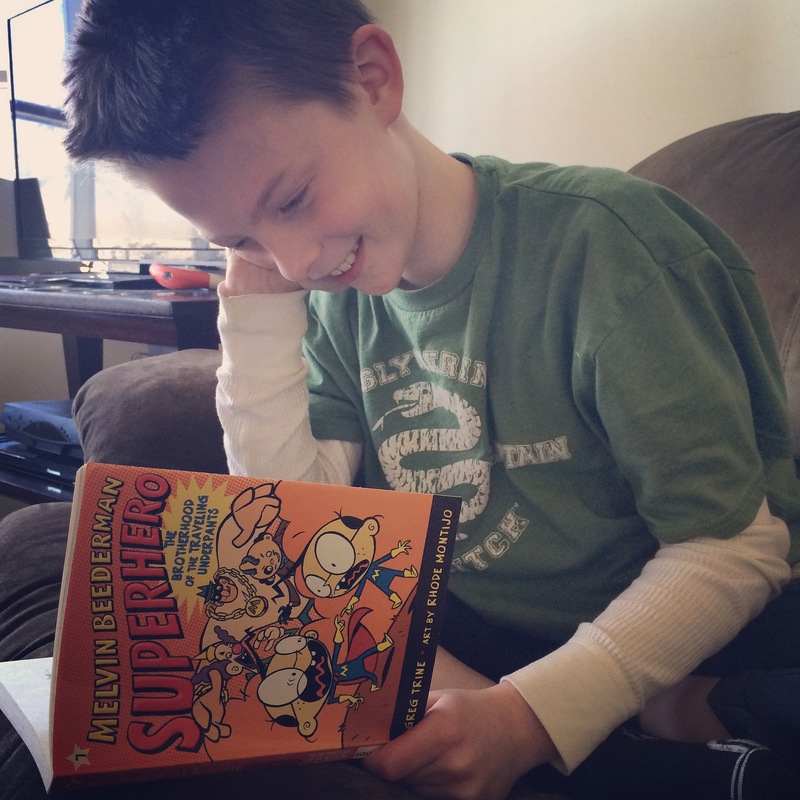 Melvin Beederman – Funny super hero stories, even though (or maybe especially when!) Melvin has trouble going up, up, and away! This series is good for struggling readers because they are entertaining for older boys but easier to read. Lord of the Rings – David is still going through this series. He’s ready to start The Two Towers. Honestly, I get lost with all the names and plot that’s deeper than in the movies, but he enjoys them! Escape from Mr. Limoncello’s Library – A boy who loves games gets to play the ultimate game when he spends the night with friends (and maybe an enemy or two) in Mr. Limoncello’s library. Holes – Stanley is accused of a crime he didn’t commit and is sent to Camp Green Lake, which isn’t green and doesn’t have a lake. But it does have holes. Stanley wonders why. Wreck This Journal – We’ve had so much fun with this, as you can see in the pictures below. Each page tells you a way to “wreck” it. You can go on Instagram and search the hashtag #wreckthisjournal and see some amazing work (you may want to search when your son isn’t looking over your shoulder and just show him the coolest ones since you don’t know what might show up in a hashtag stream!). Great list! I am so impressed that he’s reading LOTR! That was hard for me when I did it in my 20s! 🙂 Lucy loved the Lemoncello book. I will have to try to sell them on the Mysterious Benedict Society; they have it but she’s resisted it. And I plan to read the first 3 Potter books with my bigs this summer. Their first time! The bigs will love the HP books! David is doing the LOTR audio books, so that’s making them easier to get through. I think Lucy would like Kate and her bucket in the Benedict Society books. 🙂 I always love strong, smart female characters.